The Bitesize Irish Gaelic online course is helping hundreds of people to strengthen the connection to their Irish heritage through learning Irish Gaelic every day. We specifically designed the online course for people to learn at their own pace and we provided them with the best tools in doing so. 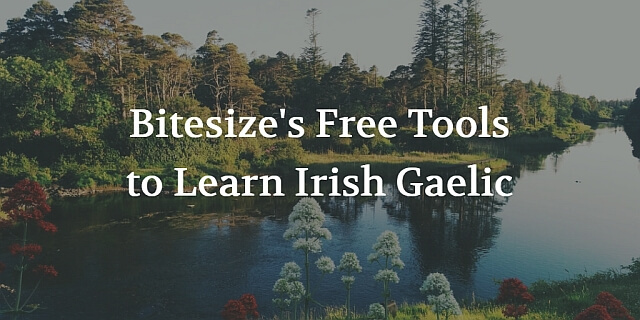 But, did you know we also have several free tools for people wanting to learn Irish Gaelic? Indeed. If you’re not ready yet to sign-up for one of our 3 membership plans, you still have several free tools to use in your quest to learn Irish Gaelic at a conversational level. Some of these tools allow you to immerse yourself in the Irish language while others focus on giving you complementary value next to our online course. Want to test our online course? You can do that for free by using our free trial. This free trial will give you full access to our full premium “Conversational” online lesson plan for a limited time. We won’t ask for credit card details. Your no–obligations free trial will begin immediately and will last for 21 days. The Bitesize “Learn Irish with Eoin” MP3 album has over 90 audio lessons and saves time by not having to be at your computer. By using this, you will learn the Irish language on the go with the possibility to copy to your phone or MP3 player. The audio program has key everyday conversation phrases, 90 lessons across four packs, and accompanying PDFs included. The full audio album with 90 audio lessons can be bought from here, but you can also preview the first 16 lessons on iTunes or on Spotify. Get Irish for Beginners tips by email over the next month. Each Wednesday, you’ll also receive our free weekly newsletter with advice for learners. We’re making this course available to you at no cost. You can opt out at any time. We won’t ask for your credit card details. You’ll instantly get our ebook for free when you join. These Irish Gaelic Pronunciation videos help you learn Irish and immerse yourself in the language by showing you the exact pronunciation of specific words and phrases. We focus on words that are helping you the most, like greetings or endearments but we also cover other topics such as prayers and poems. You can watch Siobhan’s Irish Pronunciation videos (our native language assistant) on the blog or on our YouTube channel. Bitesize Beo was a live event we held online for Irish language learners. But you can access the recorded event by watching our videos (over 2 hours) from the event. Recording for the podcast ended in 2016, but we’re restarting the podcast in a new format, this month! You can subscribe to the Podcast using iTunes or any other podcast apps on your smartphone or PC. Last but not least, you can follow us on our Facebook page, the place where we share important news & updates with our community. Also, you can always check our “Dear Bitesize” blog posts – where we answer your Irish language questions, and the Bitesize Irish Gaelic community members’ interviews that will give you great insight on others’ learning tactics and tools.